Preparing Commercial Properties for Hurricane Season | The Voss Law Firm, P.C. A hurricane can do a huge amount of damage to a business in a short amount of time, and it pays to be prepared. Hurricane season generally peaks in the time period between the middle of August through late October each year, and that time is fast approaching. This year, be proactive in making sure that your commercial property is prepared in the event of a natural disaster. You’ve had recent roof inspections for buildings on the property. Trees and other outdoor features are well-maintained and trimmed away from structures. Emergency kits are available, stocked, and maintained. You have current emergency plans in place, including plans for evacuation, utility shutoff, and ways to secure the property when a storm is predicted. As you do a walkthrough of the property, be sure to also consider the security of indoor and digital property in the event of a disaster. Hurricanes can cause untold damage to businesses through the loss of contacts, computers, digital archives, financial documentation, insurance documentation, and more. While hurricane insurance policies may provide some coverage for the loss of interior items and business documents, it’s still important to make sure that important property is stored securely and backed up appropriately. Think about how your business has changed since you last updated your insurance policy. Has it grown? Did you have to downsize? Did you make any cosmetic upgrades to your business that would cost a lot to replace? Sit down and write out anything you can think of as to how your business has changed. Then, call your insurance company to discuss how your policy may need to be adjusted to suit your current needs. Don't forget to review your business interruption coverage. 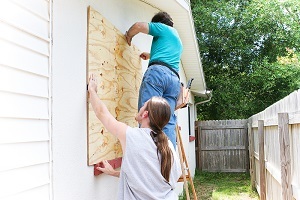 A major hurricane can physically damage your storefront or the buildings on your property, but what if that damage prevents you from opening or operating? Business interruption coverage is going to help cover you during the times you are unable to open your business and earn money, whether you are closed for days or years. Make sure you understand the situations that your insurance will cover and the ones that it will not cover. A lot about hurricane and storm-surge coverage has changed in the last decade. If you feel your business is at risk of a certain peril and your insurance doesn't cover it, ask how you can get it covered. You can never ask too many questions about your insurance policy. It's a lot better than being surprised that your insurance won't cover some major hurricane expenses after the fact. Do you own a business and have questions about hurricane losses on your commercial property? Contact the Voss Law Firm for a free consultation today. Our attorneys have experience helping businesses of all kinds resolve their hurricane insurance claims fairly and recover from large-scale losses. For more information, you may also wish to download a copy of our free book, Commercial Property Owners Must Read This Before Filing an Insurance Claim.